Great news Twilight fans! The very first Breaking Dawn Poster has finally been revealed and it looks freaking awesome! Well that would really depend on one's taste. A lot of fans finds it pretty dull and boring. Ok so maybe it is. But hey, this is just the first official poster of the movie, there's still lots of 'em heading our way before the release of the movie. Oh, if you haven't seen it yet, go check out Breaking Dawn Trailer on this site. You will totally freak out when you see it! Lots of good stuff on that vid. So there you have it folks. How's that for the first poster huh? Yeah, there's not much to see of course but hey, it's a start right? I'll bet there will be more where that came from and it won't be long now till they see the light of day and we would all drool on their awesomeness. 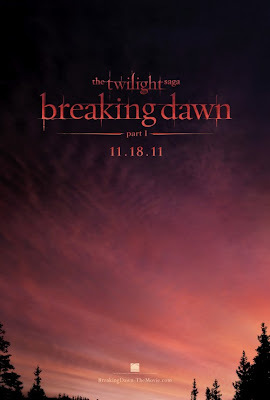 I will of course update this post every time a new Breaking Dawn Official Movie Poster is release. Just bookmark this page and check it out regularly so as not to miss any cool stuff from the movie. On the time that this post was written, there's no word yet on when the next Breaking Dawn poster will be released on the public and fans are already guessing what the next poster would look like. Some are saying that it will have Bella wearing her gown and some blood to go with it. Nice. Others are saying that it will have Bella and Edward holding on to Bella's bulging stomach or something like that. Hmm. It might work. But rather than guess on what it will look like, it would be best to just wait it out and enjoy the moment of shock when we finally lay our eyes on it. If you don't know yet the Breaking Dawn release date, the first part of the finale movie of the movie series is set for release this November 18, 2011. The second and the last film will be released on November of 2012. This will finally end the five-year reign of the Twilight Saga on the theaters.